Dr. Brooks and Dr. Gomarko are dedicated to improving the health and function of their patients. They do this by combining traditional chiropractic care with state-of-the-art technology to deliver an unprecedented level of service. 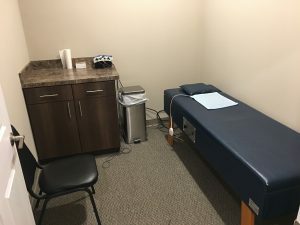 Phase 1 – Electric Muscle Stimulation- Prior to beginning Decompression, the patient benefits from relaxation of muscle spasms, increased circulation, decreased inflammation and relief of muscle and joint aches. 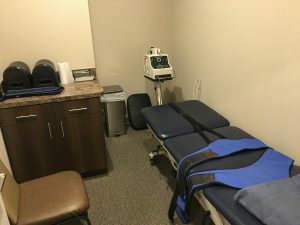 Phase 2 – Targeted Decompression following Muscle Stimulation, Phase 2 consists of decompressing the intervertebral discs relieving pressure on structures that may be causing low-back or neck pain. The task of relieving pain comes about as a result of drawing areas of herniated disc back into place. Decompression achieves this by creating negative pressure within the disc, referred to as negative intra-discal pressure. This creates essentially a vacuum to draw the bulging and herniated disc material back into the disc space and relieve pressure. As the ligaments that hold disc material in place become stretched or torn due to bulging and herniation, decompression strengthens the ligament bands that hold the disc material in place to heal & prevent future recurrence. Phase 3 – Core-Stabilization exercises Once pain has diminished, it is recommended that the patient begins an exercise program to strengthen supportive core muscles and improve flexibility. the FDA to relieve pain associated with herniated discs, protruding discs, degenerative disc disease, posterior facet syndrome, and sciatica.